Finally my copies of the two new FTD releases arrived with the mail! 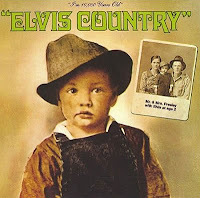 Elvis Country was the first one I played and not very surprisingly the snippets of "I Was Born About Ten Thousand Years Ago" were included between the songs from the original album. As I've stated before, it would have been nice to have them first with the snippets and then without, even if that meant a 3 CD set. When it comes to the outtakes, most of them have already been released before, on regular RCA records as well as on FTD albums (A Hundred Years From Now and Nashville Marathon come to mind). In fact, "Tomorrow Never Comes" and Where Did They Go, Lord" are the only two songs that offer us a couple of "new" full running unreleased takes. Speaking of the booklet, it's full of interesting pictures, nearly all of them showing Elvis at an early age. My favorite is the one of Vernon and Elvis taken in Tupelo 1948. Another one shows Elvis together with a lot of other children, after he has won fifth place in the talent show singing "Old Shep" at the Tupelo Fair in 1945. And he wears glasses! That's a little mystery all by itself. On the downside, the booklet offers no "Behind The Scenes" information, as the other 7" FTD do. So if you want to know more you have to look elsewhere. 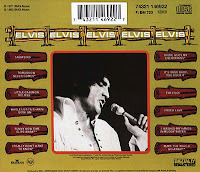 I recommend the excellent linear notes written by Colin Escott for the digitally remastered Elvis Country CD BMG released in 2000. Returning to the FTD release, I think Ernst Jorgensen and Roger Semon have done well with The Country Jam that brings together "Faded Love," (Country version) "The Fool," "A Hundred Years From Now" and "Little Cabin On The Hill" in the chronological order they were recorded. It's also interesting listening to the studio banter before "Whole Lot-ta Shakin' Goin On." For some reason, Elvis is irritated after the rehearsal of the song (why isn't the rehearsal included, too?) but maybe it's his irritation that leads to the frantic performance! And I bet he got even angrier after hearing the rough mix with overdubbed horns, I for one am glad he ordered them removed. So there you have it. Not very many surprises but a welcomed addition to my FTD collection. Finally I can make my own complete Nashville Marathon compilation, putting all the released takes of the songs in the order they were recorded on six 6 CD's.